The number of cast on stitches should be a multiple of 6. Repeat directions across the row. Repeat these 16 rows until blanket is desired length ending with a row 5 or 13. Cast off, finish off, secure and weave in end. Great pattern. Thanks for including the variety of sizes, too. Heather, I discovered your site while scanning Purple Crying Baby Site. I lead a group who makes Chemo Hats, Baby Hats, Blankets for Babies, Sick Children and Palliative Care patients at our local hospital here in Boone NC. Your Patterns are So Gorgeous and it is so Sweet and Caring of you to share. Thank You So Very Much. Blessings to You!!! My first crochet project was a ripple afghan, but you have taken the art to a whole new level. I have never seen such beautiful ripple afghans! Thank you for sharing these with us. Fantastic pattern. very soft. love blankets this one is such a good and easy knit that it can be put down and picked up with ease. This pattern is beautiful and so simple to do! I’m a beginner knitter and am truly enjoying it. Thank you for sharing! Thanks so much for all of your beautiful patterns! I am starting this one right now!! Thanks for this lovely pattern and picture! Looks so cuddly and pretty easy to knit also! This is the first one of your patterns I have seen so I’m going to look further into your site! size 11 needles. I cast on 126 sts – med. size – it worked up beautifully. The size was 40″ w by 45″ L – crib size. I am a fairly beginner knitter who was hoping to venture into two colors. I was wondering if this pattern would work with the double stripes being a different color from the rest? And if so, would I just knit rows 6-8 and 14-16 using the complimentary color? Then would i just carry the other color up the side? Or would that just be way off!? Any help you can give me –or suggestions for an easy two solid color (not variegated yarn or double yarn knit) baby blanket pattern– would be much appreciated. Thanks for your time and expertise; your site is very inspiring! To carry the main color up the side, the contrast color would need to be used for an even number of rows so that you would return back to the side that has the yarn waiting. It also is best to do a knit row (front side) as the first row after a color change, otherwise you will get a mix of the colors forming the purls on the front side of the blanket. So, with those two things in mind, what you are thinking will work great if you use your secondary color for rows 5-8 and 13-16. I think it will give you exactly the effect you are looking for. love this pattern!! it’s simple and beautiful!! can’t wait for my friend’s baby shower!!!! thank you for sharing! It just depends on how he will be using it. Project Linus defines a child’s security blanket at 36″ by 45″. If you want to make a blanket a little bigger than the extra large, you can add 24 stitches to your cast on and get a 37″ width. thanks for pattern, will knit for my wee grandson who is due in july,for the car seat..
What size is ideal for a car seat? I did some looking around on the internet and found lots of differing opinions. I found things from 16″ square to 30″ square. The blanket I used for the car seat was 36″ by 44″ and I just folded it for extra warmth and could tuck in around him and under his feet and legs. Thank you so much for sharing your patterns. I have been knitting about 1 year and I really like simple patterns. I am preparing to make a baby blanket for a great nephew. I think I want to make the Little Checks blanket..but I have a question regarding yarn and needle size. I was planning to use Caron Simply Soft yarn, I know this is a #4 and it will be heavier than the baby weights. I want to use a yarn not so “baby-baby” because I want the little one to use it for years to come. Do you think this yarn will make up ok? Or should I get the baby weight yarn? Caron Simply Soft will work great. I’d use a 7 or 8 needle with it. I think the yarn calls for an 8. The pattern is almost all garter stitch with some stockinette blocks. It looks much more complex than it really is. I assure you it will look like the photo. HELP!! I’ve just leatned to knit! Can I use 2 strands together to make this lovely afgan/blanket? How will is make up? What size needles would you recommend and how much wool would I need using Lion Brand Baby Soft.Gauge: 22 stitches and 30 rows = 4 inches in stockinette. I would like to make the extra large & would like to put a boarder around it – how many stitches should I cast on? Love you site! What kind of border would you like to add? Do you want to add a built in knit-as-you-go border, or an after-the-fact border? I used that yarn doubled with a size 9 (5.5mm) needle and got a gauge of 16 stitches and 21 rows to 4 inches. With the pattern as written, a 31-1/2″ by 42″ blanket would take a cast on of 126 stitches and take 3 skeins of the yarn (5 oz skeins). Just let me know if you need more information for the border. How would I put a knit-as-you-go border with this please? I am a fairly beginner knitter and want to knit this for my grandson to be (large for his cot I think using the extra stitches you said to someone earlier, and maybe another for the car/pram smaller). I am thinking of using 8ply yarn which is the DK weight(Australia) and my new 6.5mm circular needles to make it easier to hold (but knitting flat of course. Would I need to use 2 strands together for it to work with the 6mm needles? I would recommend using two strands with 6.5mm needles or it will be very loose and gauzy. What kind of border would you like? I will note that this blanket doesn’t have to have a border as other blankets require. I usually include knit-as-you-go borders on blankets because they have a largely knit pattern that curls. This one has a naturally varied knit and purl, so lies flat as it is. If you want to add a border for the look of it, I understand. Typical knit-as-you-go borders are garter stitch, seed stitch or moss stitch. I have decided to buy new smaller circulars as I love the look of this blanket. I might try the pattern as is to start with and if I might like a purely decorative border maybe seed or moss stitch. A half size is not going to be a significant difference. I’m sure it will turn out beautifully. I love this blanket and am making it up in white Caron Simply Soft for a baby shower next Thursday. I am making the small size but in the heavier yarn it will be the size I want. I have done 12 rows using a size 10 needle which is of course not as dense as the recommended size eight but also not gauzy. I am using the larger needle for a lighter texture as we are in Southern California. What are your thoughts? I made another baby blanket in a baby sport weight yarn in a basketweave pattern and it was popular with the parents because it was light. A blanket I crocheted in Simply Soft before using the recommended hook has never been seen on the baby because I think it is too heavy. Can you weigh in on warmer climate baby blankets? That all makes a lot of sense. Thanks for sharing your thoughts on warmer climate baby blankets. I think you are absolutely right about using larger needles to get a less dense blanket but without it looking gauzy. Yarn choice can make a big difference in how warm or dense the blanket is as well. I have a question. I have Debbie Bliss Baby Cashmerino yarn that I would like to use to make a blanket for my first grandson. I thought about knitting two colors together so I got yellow and blue. Could I use that for this pattern or would it look too busy? It drives me crazy that I am not creative enough to figure this out. I can follow a pattern and do anything that you tell me to do….but I have to see it or have some help before I start. If not this pattern, do you have one you suggest? I think that will work just fine with this blanket. I have seen pictures of this blanket made with variegated yarn, and it makes a very lovely blanket. With something other than just a single color, the pattern will not be quite as clear and distinct, but it still works well. Thanks for sharing such lovely patterns. Please advise me as to which one of your beautiful baby blankets to knit that I could use light weight #3 yarn. Should I use size 5 or 6 needles. Thank you! All my baby blankets are made with #3 yarn and size 6 needles. Do you have the time to give me quick instructions on how to knit this pattern as a 10″ x 10″ square for an afghan? I am a beginnning knitter and do not know how to scale down a pattern. Also, is it OK for me to change the size of your pattern? I am attempting to knit enough different patterned squares to sew together for an afghan I want to give as a wedding present. Thanks for your help. If your gauge matches the gauge of the pattern, cast on 54. Just a quick question. I have been working on this off and on for a few months and am a new knitter. I think I have lost my place and need to know if the even rows are the right side or the wrong side? Can anyone help me figure this out. I would like to get it done before Christmas for a gift. Thank you! The odd rows are the right side rows. Even are the wrong side. Is this including the CO row (BTW I’m doing a long tail CO and the tail ends up on the right before starting the project)? I’m a new knitter too and I’m getting varying info online. Thank you! Row 1 starts after the cast on row. Casting off is done with the last row. Hoping you can give me some ideas on how to knit two colors for this pattern. Would I simply just knit a handful of rows and switch colors? Any recommendations on when to switch colors for the medium size blanket? I am trying to use black and pastel yellow to create a steeler like blanket for a baby. I should also mention that I want smaller black rows than yellow. Thanks for your help and insight. makes rows 13-16 in black and all others in yellow. Make the black bands for rows 7-14 or for rows 15-6 at intervals to give the desired width of yellow stripes. Hi I am a new knitter and I am going to tackle this beautiful blanket. But do I use straight needles and how long for the big one ? Or do I use circular which I have never used before. Thank You I need all the help I can get THANK YOU and wish me alot of luck. I haven’t found a lot of variation of lengths in straight needles. You may be able to do that blanket on straight needles but it will be very compressed and may be hard to control your tension. You can use a circular to do regular back and forth knitting. That is actually how I do all my knitting now. I haven’t used straight needles in years, but I have friends that prefer them. Hi, can I use an 8 ply cottons yarn for this pattern? Eg Heirloom 8 ply cotton. Would the pattern look the same? I live in a warm climate. Thanks for your feedback. That would be perfect for this. That’s very similar to what I used. I love your beautiful blankets and hats. Thank you so much for these patterns. I look forward to trying all of them. Do you have patterns for booties or socks to match these blankets and hats? I haven’t written any bootie or sock patterns yet. You might use a basic bootie/sock pattern and use the blanket pattern on the cuff or ankle. Great blanket and easy to follow pattern. I have chosen to ‘knit/purl em as I see em’ on R3 and R11. It gives both sides of the blanket a more similar look and less of a right side and wrong side. Thanks! I am making the size medium blanket and I am having problems with not having enough room on the needle for all the stitches, what am I doing wrong?? When I’m making a blanket, I usually use a circular needle but knit back and forth like straight needles. Thanks for leaving this adorable blanket! I’m making it for my brothers baby on the way! I haven’t been able to find that online. What is the gauge given on the yarn? I am thinking of using Lorna’s Laces Shepherd Bulky on size 10 needles to do this blanket. I would like a finished blanket of approximately 36 x 45. Getting myself crazy here – how many stitches to cast on? A follow-up question on number of stitches – if I used worsted yarn on a #8 needle, how many stitches would I need to cast on for the same size blanket, 36 x 45? Math seems to have deserted me! Thank you yet once again. Also, I would like to say that I have made several of your baby blanket patterns for not only babies but older children and they all have been well received – the parents love them. Thank you for sharing your talents. Thank you now I can start my projects ! Thanks for all of the great projects ! Could you send me a picture or pictures of what is happening? That would help me diagnose the problem. Knitting each row produces the garter stitch. There are garter stitch rows between the sets of checks. I assure you the pattern produces what is in the picture. Hi I was just wondering, I bought some super bulky yarn (gauge 6) and I have size US 13 circular needle, would this patter work well for this size yarn and needles? It will work for that, just won’t be consistent with my measurements and yarn requirements. Thanks! I hope it turns out well. Hello~ I’m a beginner knitter…and I’m really interested in trying out to make this blanket. I’ve already started…but it seems I made a mistake. For several rows, the pattern shows on the right side. But now, the pattern shows on the wrong side. I don’t know how I made that mistake. Can you help me? In this pattern the odd numbered rows are front rows. If the front of the work is facing you when you are beginning a row then it should be an odd numbered row. That should help you keep up with which row you are on. I really love this pattern and have already knit a hat using the pattern. I am now working on the blanket. I am using a bulky yarn for this and it is turning out quite nicely. My question is I am making the large size, but I’m not too sure how many yards of yarn I will need for this. My best estimate is just under 2,000 yards. This is a beautiful pattern! I am planning to use Bernat Baby Sport “Baby Baby Ombre” (Light “3”). I learned to crochet about 45 years ago and taught myself to knit continental about 10 years ago. My knitting experience is limited, mostly scarves with really fat needles. I have never used circular needles! The label on the skein says to use US6 knitting needles and I just happen to have a set of circular needles that are size 6 and 29″ long. They are plastic and the brand is Susan Bates. Will this set be long enough for the extra large blanket? If not, what size and also what brand do you recommend? Thank you! Definitely. Needles will comfortably hold a blanket twice the width of the needle and can be forced to hold 2 and a half not as easily. 29″ will hold this easily. I love your blanket patterns. Thank you for sharing them. Do you use the yarn doubled throughout? Also what are your thoughts on making blanket with cotton yarn? What weight is sugar & cream? Thank you for your help, excited to get started! I don’t use the yarn doubled at all. Sugar and cream is worsted weight (#4). You might need to use a bigger needle and the blanket would be bigger than my measurements. I made my example in cotton. I often make baby blankets in cotton. How do I know the right size from the wrong side? Never used a circular needle how do I determine the rows by placing a marker? use regular needles – What size? I need some more information. When you say 11 circular, is that 11″ long needle, or size 11 needles themselves? Also, there can be a lot of variations in 4 ply yarn. Does the yarn have a gauge on it? What size blanket do you want to make? Often patterns state which is the right side. I didn’t say it here, but the odd rows are the right side. If your stitches aren’t bunched up on the needle, you may not need a marker, but if your stitches are bunched up so that it may not be clear where the gap is between the two sides of the blanket, you can put a round marker on the needle that will be on the needle between the two ends. circular using 126 cast on stiches. Baby Yarn 4 ply. Try some rows with 10″needles circular using Patrons Worsted wool 4ply. Like the look of this because less holes showing. Using 126 stitches. Would like to have a border around the edges tell me HOW? It has a built in border of sorts. What kind of additional border did you want? Should I use circular needles with this blanket? For the smaller sizes you wouldn’t have to, but for the larger sizes it would probably be easier. I knitted this lovely pattern last fall using Bernat Softee Baby (#3 Light)variegated yarn; 120g/4.25 oz. I wanted an extra large blanket so I casted on 198 stitches making this blanket approximately 36 x 45. I am going to make this blanket again using LionBrand Baby Soft (#3 Light)variegated yarn; 113 g/4oz. What size needles should I use, and should I use two strands of yarn or just one? Also, I would like to make a border this time. What stitch would you recommend that would compliment this blanket? I would appreciate any suggestions you might have. Thanks for your time. Those yarns are the same weight, so if you liked the result on the first blanket, then you can use the same needle size and single strand for this one. If you want the blanket to be thicker, you can double up and use a larger needle. The blanket has a lot of garter stitch in it already, so adding some garter stitch before and after and doing a few stitches of garter on either side would look very natural. If you want the border to look more distinct, you could use seed stitch. Great pattern and most of all easy to follow! Thank you…..
can I use Bernat baby blanket yarn super bulky with this pattern and what size straight needles would I use to make this pattern ! I love the checks in it ! Also how many cast on stitches to make a medium size blanket? Thank you ! That yarn recommends size 11 (8mm) needles and has 2 stitches per inch. For a 24″ wide blanket, cast on 48 stitches. If you decide on a different width, you can use any cast on that is divisible by 6. I’m about to make this blanket for my soon-to-be new grandchild. You say the yard should be DK weight baby yarn. What does DK mean? It looks like a fun and easy pattern and I can’t wait to get started! Double Knit. It’s the next lighter weight from worsted. DK is a Light-3 under the new system. Hello , Can I use size 10 – 40 inch circular needles using Caron Jumbo print yarn 4 worsted weight to make this baby blanket and how many cast on stitches to use for a medium size blanket ? I really appreciate your help! Beautiful, lovely blanket ! Thanks ! That yarn suggests a size 8 needle so will be looser with a size 10. The gauge with size 8 is 18 stitches per 4 inches, so with size 10 needles will be more like 16 stitches per inch. For a medium sized blanket, cast on 96. Thank you Mama for your lovely pattern. I have used them for gifts a few times now. I do have a question. I may be having some up coming medical expenses. Would you mind if i sold some items to help my family with them. I will make sure to give you credit on a tag. Thank you much for your time. Please could you tell me if your Little Checks Baby Blanket is reversible. Also is the soft snowflake (DK) type baby yarn suitable to use for this pattern. It looks different on the back side, but it is also a nice looking pattern, so it more reversible than some other knitting patterns. That yarn will work for this. The pattern may not be quite as clear as with the polished cotton I used in my sample, but it should be very pretty. If I use size 9 circular needles – 40 inch length with Caron jumbo print yarn – how many stitches should I cast on to make a medium size blanket ? what a beautiful blanket and such an easy to do pattern with amazingly beautiful results ! Thank you so much for sharing this pattern . I had made one of theses before but using size 6 needles and have received so many compliments from season knitter’s . It’s so nice to be able to make a project that looks so hard but isn’t ! Cast on 90 stitches. I’m glad you have enjoyed the pattern. Hi, going to try this for my neices 1st baby, the yarn in the photo looks lovely, could you please let me know what it is and where I may get it? You can order it online several places. It’s King Tut by Knitting Fever. The color is 2880. Hello Heather, I have just completed my first baby blanket, (your Simple Lines) in the square pattern. I love it! I also love how straight forward your instructions are. and would like to try “Little Checks Baby Blanket” small is too small but I don’t have enough yarn for the medium size. I’d like to use all my skeins. Could you help me adjust the size a bit to use 635 yards? Cast on 114 and it should work out perfectly. Hi Heather, I just completed my little checks baby blanket and it looks great. I noticed the edges on the back side aren’t as straight as I would like, so I would like to add a border. Do you have any recommendations? I am a beginning knitter and this is my first project. Can I use Bernat baby coordinates sport weight yarn for this? Yes, that will work great. I’ve made several using that yarn myself. Hi! I made the hat and I’ve tried this blanket twice now and both times the pattern switches to the back side in the middle! What am I doing wrong?? Thank you! My guess is that since the rows are pretty similar to each other that it would be easy to loose count of what row you are on. My advice would be to mark the front of the work. All odd rows should be worked with the front facing. This is a pretty fast knit because most of the rows are straight knitting and within a few rows you will memorize the pattern. 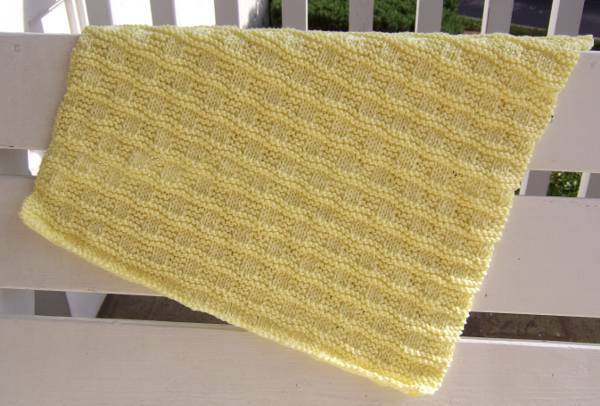 I am looking for a baby blanket pattern without holes to present to babies when the are dedicated at church. I was thinking of using Lion Brand Pound of Love. It’s a #4 and suggests using size 8 needles. Our pastor would like them to be 34 inches wide x36 inches long. Can this pattern be adjusted to this size using this yarn? If so, will you tell me how to do that? Thank you! Cast on 162 stitches with your size 8 needles with that yarn to get a 34″ inch width.